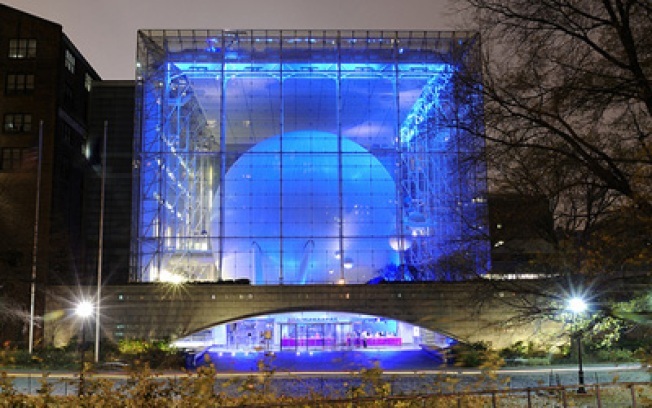 The American Museum of Natural History's Polar Rink overlooks the Rose Center's glowing orb. We have nothing against the ice skating rinks in Central Park (though in our opinion, the times we've been, the music has sucked on an almost epic level - do you really want to skate to slow jamz?) or at Rockefeller Center (though we'll never be able to look at it the same way after seeing those poor lackeys recreating the electoral map in ice on November 4) but there's a new kid on the (ice) block that beats those two for coolness hands-down (and has a good chance of being less crowded than those other two). The Polar Rink on the Arthur Ross Terrace is made from a recyclable synthetic ice surface, and has a 17-foot-tall polar bear in the middle all done up with boughs and twinkle lights. To get the full effect, plan your visit after nightfall, when the bear will be in full glow and you'll get to gaze at the globe in the Rose Center planetarium, which the rink overlooks. Then adjourn to the Polar Café for hot chocolate.